In Egypt during most of their demonstrations 2011-2014, musicians, photographers, filmmakers, dancers, actors, performance artists, creative writers, and visual artists were out in force. I witnessed these artists leading, comforting and inspiring those gathered. Farmers became impromptu artists, creating installations. Visual artists collaborated on an instrumental wall of street art. A pop-up museum was created by citizens in the middle of Tahrir Square. Egyptian artists occupied the Ministry of Culture and curated 33 days of street performances outside the complex with professional, amateur and student artists of all disciplines. Artists were catalysts. And I wrote about this all here. Here in the US, I see far less artist involvement, no matter the cause for protest or demonstration. Perhaps we fear lost funding or board support. 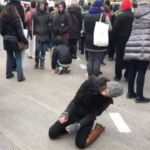 Well, during today’s event in Chicago, I felt moved to move and went for it. “This is a movement,” we were chanting. I didn’t bring a demonstration sign, but I brought my demonstration body. No one joined in, but several supported me. Other people just casually walked by. I asked an artist friend to record it as time-lapse. 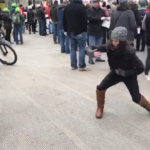 In front of Trump Tower Chicago, at the back of the crowd, in the frigid wind, I danced of my own rawness and it felt amazing. 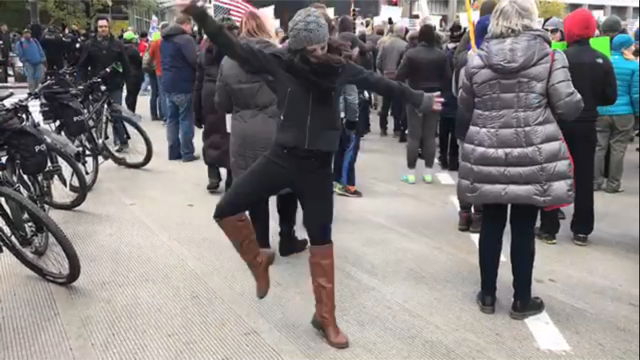 I danced of newly strengthened vigilance, particularly for my friends and family who are refugee, immigrant, Muslim, LGBTQ, Latino/a and Black Americans, and fellow sexual assault survivors. It poured out. My dance was improvised in celebration of the America I love and have spent years promoting during my experiences in various international programs such as the UNAOC, Fulbright, British Council’s TN2020 and EducationUSA. My danced improvisation was also in defiance against what Trump has come to represent as well as his cabinet choices so far. If art is safe, it’s commerce; art left to itself is revolution. A person in my social media world, posted that quote today and I thought it was great, I assumed it was a quotation, but I have yet to find a source; maybe it is original. If you know the source, comment below. In any case, it eloquently conveys my point. While the content of my art is not generally political in the least, it’s the people, place and time of the art making/learning/sharing/performing that make the revolutionary statement. That’s how I choose to make my push toward positive social change, as a partner in collaboration. That’s my artform. Yet today’s little moment was quite different, it was an improvised solo. And I kept thinking that this weird solo is only remotely art for me if I can use it to inspire others to either A. join me next time with their own artistic contribution, or B. find their own way to be artists in the world during the Trump administration. I know a handful of artists, arts educators, and arts supporters who voted for Trump. When I encourage the arts community to protest and advocate, I very much include those friends as well. Let me explain. Former Illinois Governor Pat Quinn was at today’s demonstration collecting signatures. He spoke of the importance of taking things one issue/policy at a time, making progress by referendum. In the next four years, that strategy will become particularly important for artists. I hope that as Quinn said, we can look at issues from a non-partisan, human, constitutional perspective. My hope is that we will find something that we can agree to protest/demonstrate/advocate for together. Let’s start by joining together both online and off. Let’s keep learning. Here’s one quick venue: Americans for the Arts is hosting a post-election webinar this coming Monday 11/21. The cost is $35 and goes to their important arts advocacy efforts nationally, but if you need the promo code to participate for free, it is ArtsActionPromo.